Egypt and the Arab world are blessed with abundant solar energy resources. Located in the “sun belt” with powerful solar radiation and dependably clear skies, and having vast tracts of vacant desert land suitable for mounting solar installations, this region is the ideal venue for adoption of solar technology. A formidable challenge facing the Arab world, however, is to harness the seemingly limitless potential of solar energy as a practical engine for social and economic development. It is a challenge that Dr. Salah El-Haggar and the coauthors of Sustainable Solar Energy Systems meet head on. This volume goes beyond conventional studies of solar technology and economics to address the everyday needs of underserved populations, particularly the rural poor. As Dr. El-Haggar and his co-authors vividly describe, even when fossil fuels (e.g. kerosene, diesel, wood) are available to such groups and are affordable, dependency on conventional fuels for household needs and agricultural work undermines their health, saps educational opportunity and blocks economic advancement. This is especially true for women and children. The authors first provide the reader with a basic grounding in the science of solar energy, both thermal and photovoltaic, the engineering of solar energy systems and the economics of typical solar energy applications. As the authors point out, the world is in the midst of a veritable “solar revolution,” with steadily falling prices for solar panels and continuous improvements in solar technologies. Once past these basics, Dr. El-Haggar and his colleagues demonstrate how solar energy can readily be adapted for rural household and agricultural needs such as cooking, domestic hot water, heating, cooling and ventilation of houses, drying of agricultural products and off-the-grid electricity requirements. Of special importance for Egypt and the Arab world, which face chronic water scarcity, is the explanation of how solar energy can facilitate desalination, the conversion of seawater to fresh water. The book ends with an ingenious study of how proven solar hot water heating technology can be adapted for large-scale poultry production. By using computer simulations, the authors show that not only is it technically feasible to substitute solar energy for much of the diesel fuel currently used to warm hen houses, but converting to solar makes compelling business sense for poultry farmers as well. Dr. El-Haggar and his co-authors have deftly bridged the gap between the academic science of solar energy and the practical applications so desperately needed by underserved populations. This valuable handbook can lead to more rapid dissemination of solar technologies in the region and to better health, educational and economic opportunities for the rural populations of Egypt and the Arab world. This book is unique in that, as far as the authors’ knowledge, it is the only basic comprehensive guide to solar energy and the potential use of solar powered technologies for sustainable development, primarily on a grass-roots level. The book provides an introduction to basic concepts of solar energy, describes the mechanisms and benefits of related technologies, and suggests potential uses on a practical level by examining case studies. 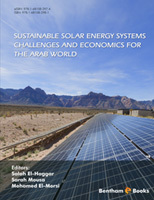 Detailed economic feasibility studies are presented in this book to encourage the implementation of sustainable technologies in the field of solar energy and help communities, especially in the Arab world, live a more sustainable life. The focus on the Arab world in this book stems from the noticeable changes in the environmental and political climates there which provide a great opportunity for the harnessing of renewable energy. This book strikes a balance between simplicity and comprehensiveness in the fact that although no specialty background knowledge is needed to read it yet it offers broad understanding of solar energy and its applications. The urgency of exploring alternative energy sources, especially in a region so detrimentally affected by current energy practices on environmental, humanitarian and political levels makes this book a crucial element in raising awareness and activism in the field.